WP1 Slider Pro – allows you to create powerful sliders without even touching the code! Most of the premium plugins are so much complex that it takes lots of time just to understand how to create a slider with it. We know the pain that you get while creating sliders as a non-techie. So, we’ve made WP1 Slider Pro which helps you create a powerful slider in no time without any coding. You can create content sliders, slideshows, image galleries, post sliders, WooCommerce product sliders, video sliders, team slider, testimonial slider, slider in laptop/mobile/frame, logo slider, SoundCloud Audio slider, partial view slider, full width & auto width slider. And, you can have ken burns effects in your slider images. Besides, you can create sliders/galleries with your Facebook and Instagram images! Authorize your social account to pull and use images directly and then create the slider/galleries with them. WP1 Slider Pro is greatly responsive, touch/gesture friendly, load speed optimized, cross browser compatible, and SEO friendly. It has already been tested with the greater number of plugins/themes. So, you need not worry about the compatibility issue. It comes with 23+ different animation effects, 15+ beautiful layout options, arrow styles, auto controls styles, full configuration power to pagination styles, fonts, colors etc. Besides, you can even upload your own custom arrow. Get a hassle-free WordPress slider for non-techies now! Assign them animation and effects. Thumbnail pager images for Youtube, Vimeo, and Html5 videos. 3 awesome templates for single video sliders and 4 differents templates for videos carousel slides with video dynamic settings. 2 awesome templates for video background slider with video dynamic settings. 2 awesome templates for single post slider and 6 awesome templates for post carousel slides with dynamic settings. Multiple layer which can be text or images with 22 animation features and different entrance timing settings for each title, description, button and layers. Not just sliders – make image galleries to be placed anywhere on the page. 2 awesome templates for carousel layout of instagram , facebook and woocommerce. Lightbox effects in carousel effect of image slide, video slide and post slide. 16 beautiful thumbnail pager (navigation) layout, both vertical and horizontal. Mixed Slider which can be mixture of image, video, content slide. All slider components are Search Engine Friendly. Add unlimited amount of images to the slider WP1 Slider Pro. Seven different dot pager(slider navigation pager) layouts for each slider. Thirteen different horizontal thumbnails pager(slider navigation pager) layouts and three different vertical thumbnail pager layout for each image, video and post slider. Separate navigation / Arrows setting for each slider (25 designs to choose from). Ability to change colors of title,description, buttons and button hover on slider image. Shortable Slider Drag and Drop functionality: Drag and drop images to rearrange their sequence in the slider. Six different transitions for slider.Horizontal ,Vertical,Fade,Skew Horizontal,Skew Vertical,Zoom In. 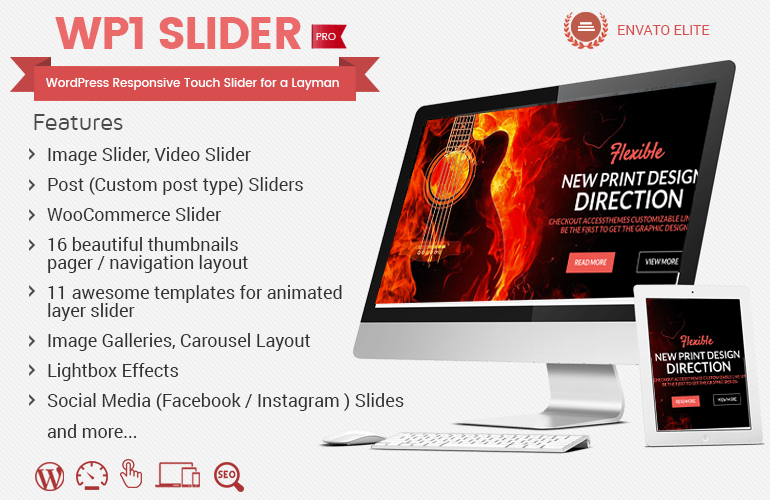 Hey Buddy!, I found this information for you: "WordPress Responsive Touch Slider for a Layman – WP1 Slider Pro". Here is the website link: https://access-keys.com/wordpress-plugins/wp1-slider-pro/. Thank you.